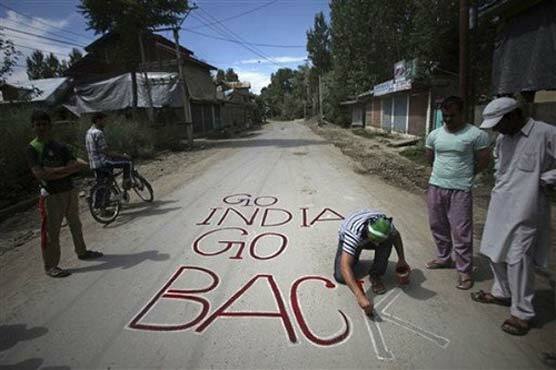 Kashmiris on both sides of the Line of Control and the world over are observing Black Day today (Monday) to protest against India s decades-long administration of the disputed Himalayan region.They have long criticized India for forcibly occupying the territory of Kashmir, which otherwise has been a free princely state. The call for the observance of the black day has been given by Hurriyet leaders including Mirwaiz Umar Farooq, Syed Ali Gilani, Shabbir Ahmed Shah and Muhammad Yasin Malik. On the occasion, residents deserted streets and closed businesses in the Occupied Kashmir. In Azad Kashmir, protest rallies and demonstrations would be held at all Districts and Tehsil headquarters to mark the day. In Muzaffarabad, a protest demonstration will be held at District Complex under the auspices of Jammu and Kashmir Liberation Cell. The participants of the demonstration would hold a rally up to UN Military Observer Mission to hand over a protest memorandum calling upon the world body to take serious notice of state terrorism in occupied Kashmir and play its due role for resolving the Kashmir issue. It was on this day in 1947 when Indian troops invaded Jammu and Kashmir and occupied it in total violation of the Partition Plan and against the aspirations of Kashmiris. Earlier on Sunday, Pakistan Peoples Party (PPP) Chairman Bilawal Bhutto Zardari attended the Million March in London to pledge solidarity with the people of Kashmir and to reaffirm his unconditional support for their struggle for self-determination. The rally from Trafalgar Square to Downing Street descended into chaos as Pakistan Peoples Party (PPP) chairperson Bilawal Bhutto Zardari stepped on to the makeshift stage to speak. The crowd began booing and throwing empty plastic bottles and refused to let Bilawal Bhutto speak. He was later led away under protection. The police stepped in and ended the rally. The march was led by Barrister Sultan Mahmood Chaudhry, referred to as a former prime minister of Azad Kashmir, and was supported by Mirpuri-origin British parliamentarian Lord Nazir Ahmed of Rotherham.